Thousands of walkers must every year teeter with a mixture of vertigo and lurid imagination near the lip of Yorkshire’s most famous open chasm and wonder what wonders – or horrors – it holds. Gaping Gill's main chamber (above) during this year's August bank holiday winch meet. The main shaft is top centre, with the Rat and Mouse waterfalls entering on the left. The floor is littered with small rocks and muddy clay. The cavern regularly floods to a depth of 60 feet. 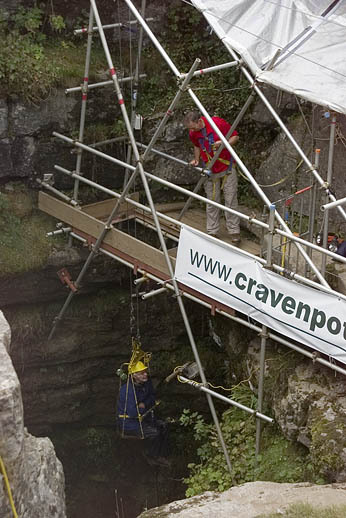 Well, twice a year walkers, and anyone else for that matter, have the chance to find out, when two potholing clubs set up winches to get the non-caving public down the 340-feet-deep Gaping Gill. In this account, grough joins the throng heading out of Clapham on the August bank-holiday weekend towards the gill, at the foot of Ingleborough, another of Yorkshire’s iconic names. The walk from Clapham takes about an hour. It can be made either by paying 50p to walk through the Ingleborough Estate’s nature trail along Clapdale or by the alternative (free) Long Lane, which follows a roughly parallel course, before joining the route through the ravine of Trow Gill. The first shock of the day is being greeted by the ‘Sorry, closed’ sign (pictured right) on our arrival just after noon. With a little, very gentle, persuasion, the booking staff allow grough to hand over his crisp tenner and collect his tally – number 190 – on the understanding that it will be at least 4pm before going down and about 6.30pm before we will be back up again. 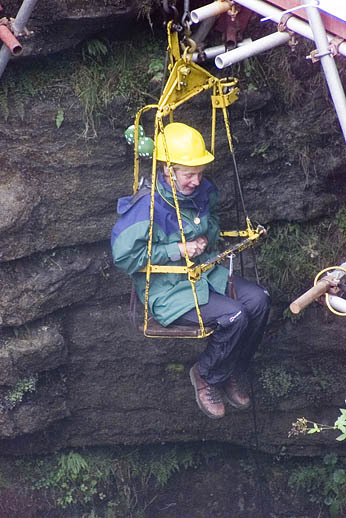 So, lesson number one for any potential visitors to the Gaping Gill winch is to get there early. Craven Pothole Club members reckon they can squeeze in about 200 return trips each day on the chair, including club members taking the opportunity to do some real cave exploration, and each up-and-down journey takes about three minutes so, doing the maths, in their ten-hour stretch, 200 is the limit. Since they aim to start winding down (you’ll get 100 lines if you make another pun as bad as that – Ed) around 6pm, you’re going to be disappointed if you arrive at the pothole much later than noon. On the last day of the meet, 10am is the cut-off point for booking in. The gantry and winch system takes about 3½ days to set up. The winch is operational for 10½ days, and opens at 8am. According to the club members in the booking-in tent, weekdays are just as busy as the weekend. 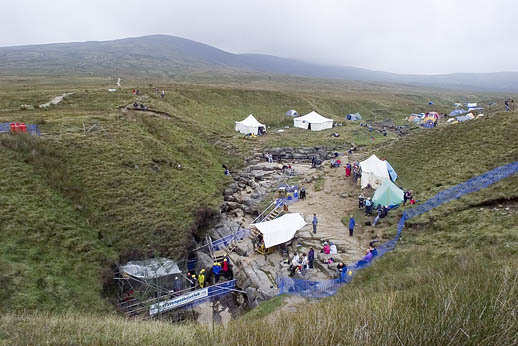 Anyone familiar with the area around Gaping Gill is met with an extraordinary sight as the array of tents, marquees and all the other paraphernalia (pictured above) greets the visitor after passing Bar Pot, another entrance to the Gaping Gill system. It’s as if someone’s misdirected a travelling circus as a huge joke to this normally windswept moorland wilderness. There are banners, flags, the sound of a diesel generator and its accompanying fumes, tents galore and crowds aplenty. 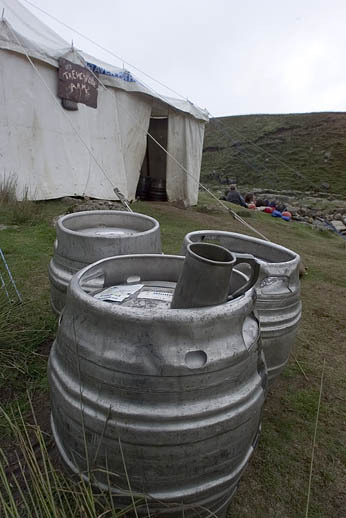 There’s even a beer tent for club members, the Trenchfoot Arms (pictured below), with three barrels at the entrance and a discarded pewter pot. There is probably a greater population here than in many Dales villages for the duration of the meet. 2,000 people will make the return trip to the depths of the chamber while the winch is operating. With the news that there’s a wait of at least three hours before a trip down the hole beckons, grough decides a trip up Ingleborough is in order. It’s rude anyway, in grough’s view, to pass a fell or mountain without climbing it, so it’s off up the tourist path to Little Ingleborough and then on to the summit plateau which, as so often, is shrouded in cloud. It’s not grough’s favourite route (you know we like the quiet life), being busy and paved like the M62 in parts, but there’s time to go off the beaten track and play around on the fell’s western slopes before heading back down to await the subterranean ride. The board on the gantry tells grough the queue’s reached number 140, so we take the opportunity to watch the lucky ones (or rather the ones who could be bothered to get out of bed sooner) who are emerging from the chasm, from which a gentle mist is floating upwards into the deepening gloom of the August afternoon. It’s never occurred to grough that the trip might be in any way scary. grough’s no hero, and the thought of dangling 340 feet above a yawning black hole with nothing but a steel hawser between you and the trip to terminal velocity is a little sobering, but grough figures that, as the club’s been doing this since before the Second World War, the guys and gals running the operation know what they’re doing. There’s a calm, quite impressive efficiency as hand signals and a sound relay guide the winch operator as he or she lowers and raises the metal chair. Club members on the gantry watch the descent and give guidance to riders: “Cross your arms, keep them inside the chair and bend your feet back. The rocks come quite close to your knees as you descend. During the course of the meet, Fell Beck, which normally plunges full force into the main shaft, is dammed and diverted. If the club didn’t do this, the winch would be impossible to operate. Even so, there’s a fair amount of water pouring down Gaping Gill, so waterproof jacket and trousers are definitely recommended. Eventually, the number’s up and grough walks down the gantry to join the short queue. Advice on the boards tell us, among other things, to sit well back, not to kick against the rock, to sit still in the chair, face the front of the class… OK, we made the last one up, but it does serve to remind that this is not some fairground ride but a trip down a serious piece of geology. The final instruction is: enjoy yourself. And not one person we spoke to disobeyed the last rule. The trapdoor is slid open beneath you – grough can’t help but be reminded of Albert Pierrepoint – and the drop begins. The journey down seems to last an eternity (it's actually only about a minute) as slowly the daylight fades, the rock darkens and the water drums the top of your helmet. There’s a dawning of just how final would be any accidental trip down here and the previously imagined horror grough may have felt on faltering trips to the lip of the pothole are confirmed. This drop is massive! The first attempt at a descent was made in 1842 by a local farmer called John Birkbeck who, like most others in the area, feared the legend that Gaping Gill was bottomless and led straight to hell. He got down as deep as 180 feet before his superstitions overcame his valour, his ropes began to fray and he hightailed it back up. It was a Frenchman who conquered the bottomless shaft, in 1895. Edouard Martel, a peripatetic caver(!) 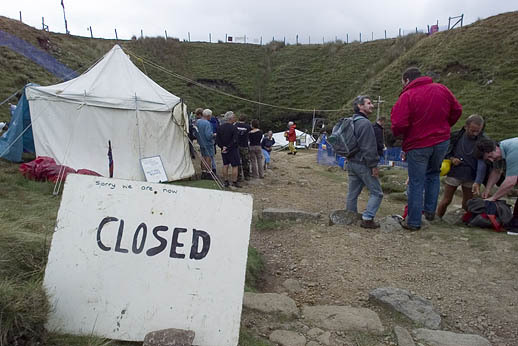 made the descent during a tour of Britain, much to the Yorkshire Ramblers’ Club's chagrin. They even had to lay their hands on a French dictionary to find out how they felt. Incredibly, someone in the early 70s freeclimbed the main shaft upwards. It took this unnamed lunatic about 11 hours. Nowadays, prussiking up on a rope takes about 20 minutes if you’re fit. The young Turks of the club have competition races to see who can ascend the fastest. The steel rope’s extension slows and we gently touch ground, or rather 340 feet below ground. 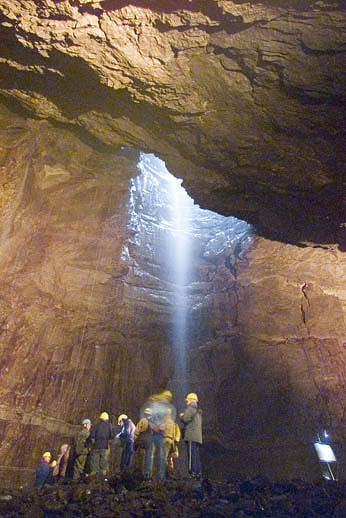 It’s hard to adjust to the darkness immediately and the operators at the foot of the winch say: “Take your time, walk slowly over to the board with the light on, where a guide will meet you.” Within seconds of landing grough on the floor of the cave, the chair is whisking a visitor upwards. In the gloom of the main chamber, grough staggers over the uneven floor to the board. Gaping Gill’s main chamber is like the stomach of some huge, stone giant. The route we’ve just used is his oesophagus and there’s a constant stream of fluid flowing down into it. Off the chamber lead passages into the bowels of the giant: dark, damp and foreboding. But the chamber itself is simply another world to those of us who normally live our lives in the light and warmth above ground. There’s no sense of claustrophobia; how can there be in a cavern big enough to fit in York Minster? The statistics alone are staggering. The waterfall we’ve just encountered is the highest unbroken one in Britain. The cave is 500 feet long, 100 feet high and 80 feet wide. Two smaller waterfalls, the Rat and the Mouse, also penetrate the cavern and speech is only accomplished above the constant sound of Gaping Gill’s three cascades. The moor and its travelling circus are 360 feet above us. grough’s tour is led by 64-year-old Ian Woods, a manager for an outdoor clothing firm. Ian’s an alarmingly accident-prone man, though happily none involving caving. Motorbikes, ski-ing, but not caving. You only ever make one serious mistake in caving, he tells us, as we watch a young potholer practising his moves 30 feet up on the north wall of the chamber. It’s a shame there are no children with our party, says Ian, because he likes to regale visitors with tales of how the chamber was blasted out by the engineering corps of a great corporation of spacemen and to see how long he can get their parents to believe him. Then he tells us the body of a German serviceman was discovered at the western end of the cave after the Second World War. I sense our credence is being tested. grough is put in mind of all those adventure films where there’s a secret underground base, full of people intent on taking over the world. 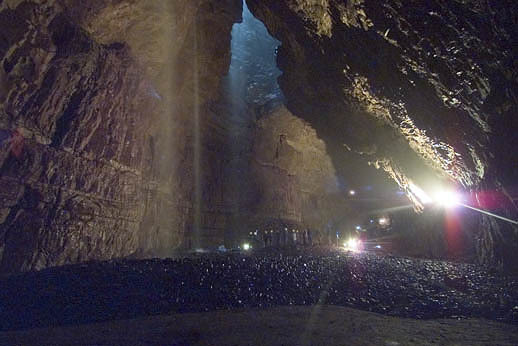 Groups of dim lights appear from the four walls of the cavern from time to time, from dark holes invisible in the low light, as the serious cavers emerge from explorations in the further reaches of the system. This place is a hive of activity. grough half expects Dr Evil and Mini Me to pop out of a crack in the wall at any time. Ian takes us to the eastern end of the chamber where a massive pile of debris is slowly collapsing. Underneath it is East Pot. Ian says it’s for the foolhardy. He’s been down it and he doesn’t want to do it again. At its base is a spindly bit of rock between two other larger ones. It’s eroding away gradually and will eventually go. And so will the hundreds of tons of rock and rubble that the cavers emerging from the Old East Passage are walking down. They’ve come from the delightfully named Mud Hall, and their outfits show it. Mud Hall, he tells us, has some beautiful decorations, that’s to say, limestone sculptures rather than the latest wallpaper from Laura Ashley, and is a fine place to visit. The main chamber itself is remarkably free of stalactites and stalagmites. It regularly floods to a depth of 60 feet – not that he’s trying to worry us – and if the winch should fail or we need to get out in a rush, we need to use our next port of call, the South Passage. There’s even a telephone at its entrance. The South Passage leads eventually to Bar Pot, which would mean a bit of ducking, but no diving and is really quite easy to negotiate, he says. grough is unconvinced. The latest geological theory, backed up by the scalloping of the cavern’s sides and roof, is that Gaping Gill was formed in an upward direction. Glacial meltwater forced its way into the fault crack that was here first, gradually eroding the great scar limestone until it forced a way to the surface. The main shaft is a blowhole, in essence. The tour of the chamber over, grough is free to explore. All through the afternoon, headtorches appear in unlikely places as mud-covered explorers come back from exotic reaches such as the Far Country, Echo Rift, Whitsun Series, Hensler’s Crawls and the Sand Cavern. And a few from less promising-sounding destinations such as Disappointment Pot and the Mud Pot. Time for a few pictures – not that easy, since there’s very little light down here – and a few final moments to reflect on grough’s visit to this speleological wonderworld before joining the short queue for the journey out of the giant’s belly. It’s late in the day and the winch crew offers us tea or coffee. A thoughtful touch from a thoroughly nice bunch of people. Then, it’s into the chair, bar clamped shut and an instruction to look to the right. grough wonders what terrible mishap will befall us if we don’t. “The view’s better,” are the last words we hear as our feet leave the rocky base of the cavern and we zoom upwards towards the light. Too soon, we’re back in the real world. Tally handed in, helmet back in the bin, rucksack back on and boots pointing back towards Clapham. On the way back, fellow travellers all agree: worth the wait; worth the money. Grough will be coming back and we’ll be telling anyone who’ll listen to set their alarm clocks and hit the trail early for a journey into another world. It turns out the three were so taken on with the meet, they've signed up to join the club and have been invited to camp with the rest of the members. Good idea. Bar opens at eight, we tell them. Don’t overindulge, or you might be at the back of the queue again. grough has been asked to point out that the bar and the campsite are strictly members only, so if you want the full experience, get in touch and get your membership form in. For the rest of us, it's the trog back down to the New Inn. I enjoyed the story, and it has given me a good insight into what to expect on the day, and the tip of going early is a good one, as me and my son are always ont the late side when heading out for a walk. Will be doing this shortly - I will try not to think of "The Descent" once at the bottom!